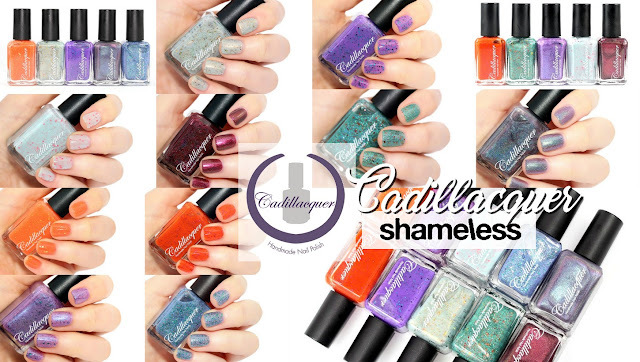 I have swatches of the new Cadillacquer Collection inspired by the TV series Shameless. I don't know the series so I can't comment on that but I can tell you that the whole collection is gorgeous! A Beautiful Mess is indeed a beautiful mess! 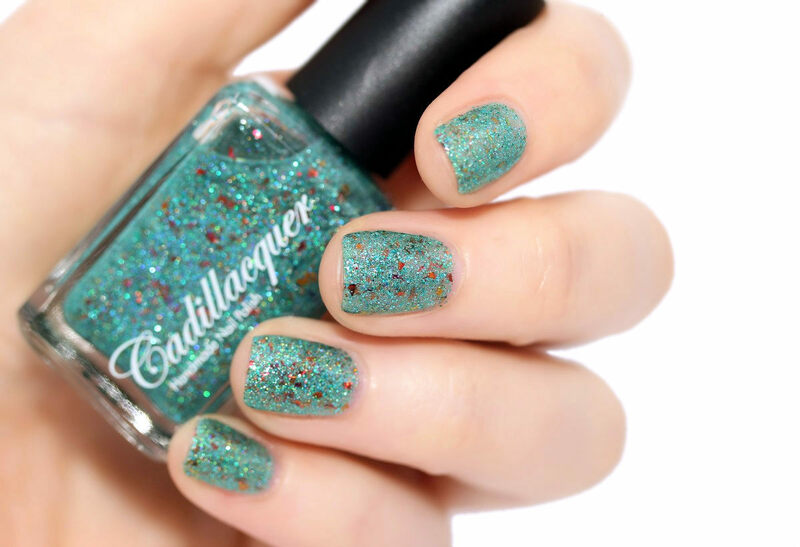 ♡ It's a green nail polish packed with tones of small green glitters in different sizes, larger red and orange shards/flakes with a scattered holo base. 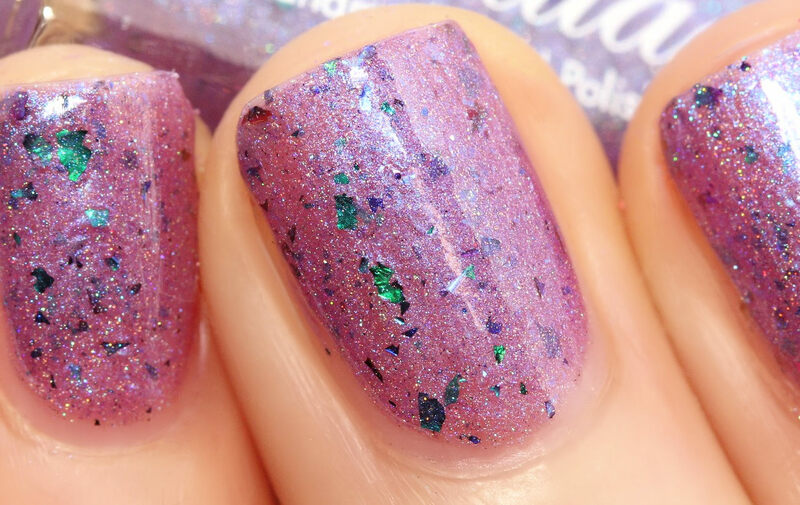 This polish so unique, so beautiful. I'm in love!...might well be one of my favorites of the collection! I used 3 coats here for the pictures but I would wear it with 2 coats in real life even if it's not 100% opaque at 2 coats. 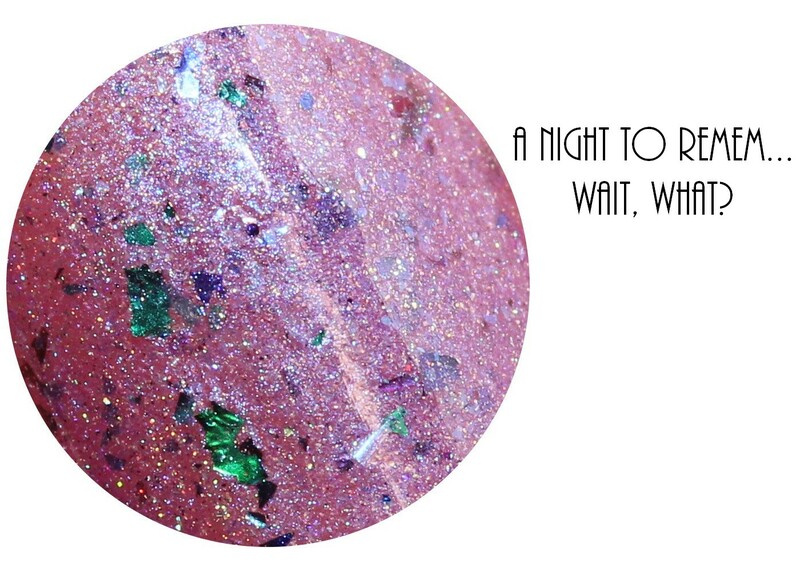 A Night To Remem...Wait, What? is a purple polish with a strong blue shimmer, metallic green flakes and a scattered holo base. Chicago is the darkest polish of this collection. 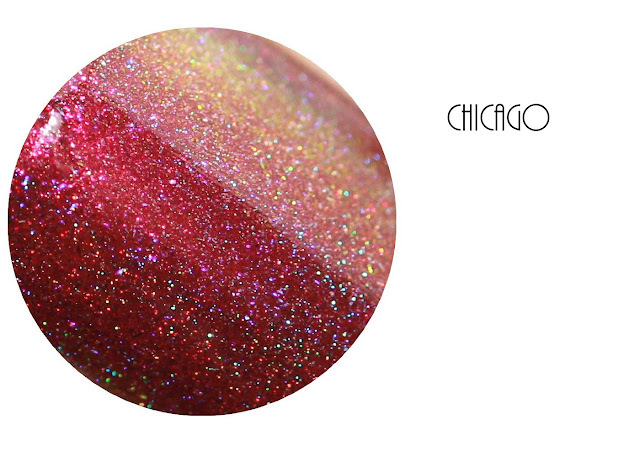 It's a deep wine polish with fuchsia shimmer and a holo base. It shifts to gold/green in some lightening. It's a very deep, chic and beautiful shade. 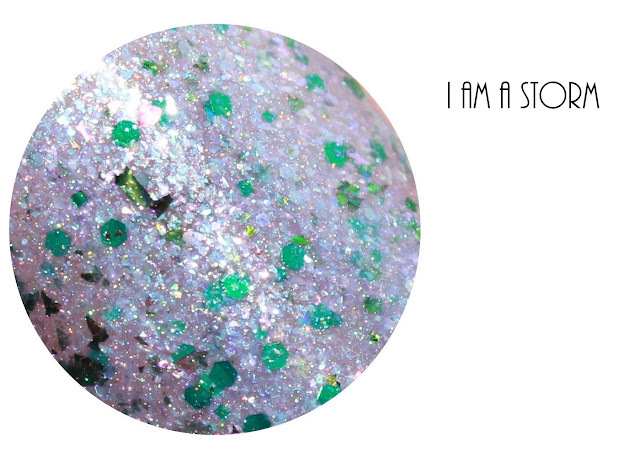 I Am A Storm is a dusty blue polish with lots of tiny blue flakes and green glitters. It looks like you were wearing jewels on your nails. 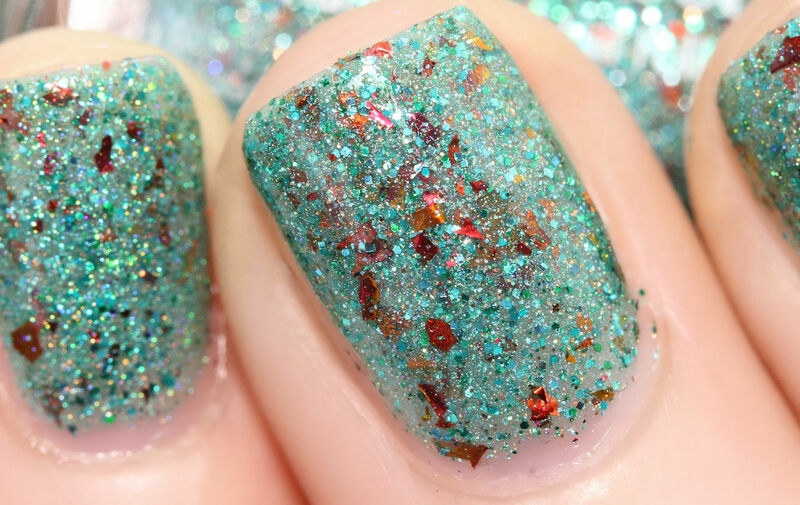 This one could look very pretty layered over a black polish. I Only Miss Her When I'm Breathing is a mint polish with strong gold shimmer, coppery-gold glitters and flakes as well as green flakes. Everything is supsended in a scattered holo base. This is another veeeeery pretty one! Shameless is a very very bright orange polish with purple glitters. It looks very summery and I can already see myself wearing it when the temperature rises. 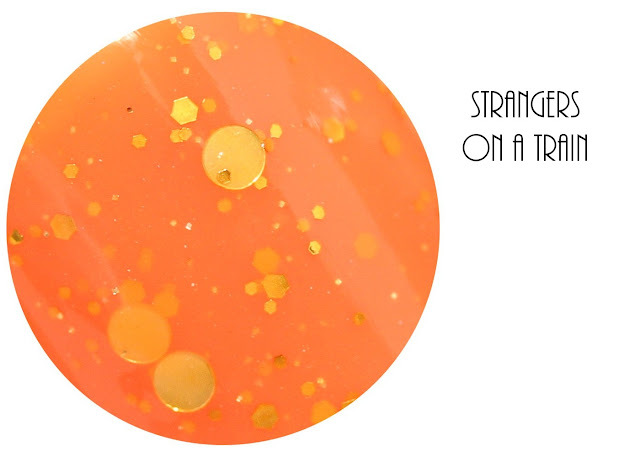 Strangers On A Train has a soft mango base with small hex and larger yellow glitters. I think it's another super unique polish! I love the combination of the mango base with the yellow glitters! Tell Me You Need Me is a soft and dusty bably blue polish with a jelly consistency and neon pink glitters as well as holo microglitters. 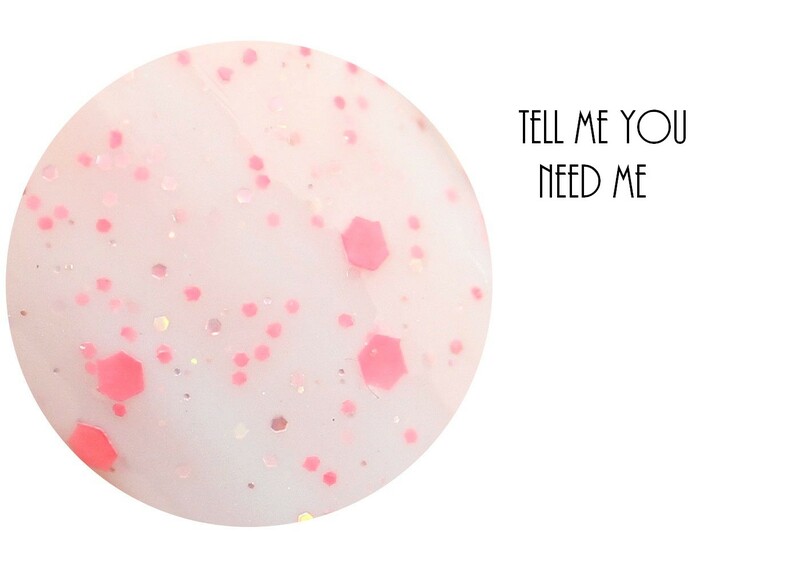 It's a very soft and peaceful shade even if there are neon glitters in it. 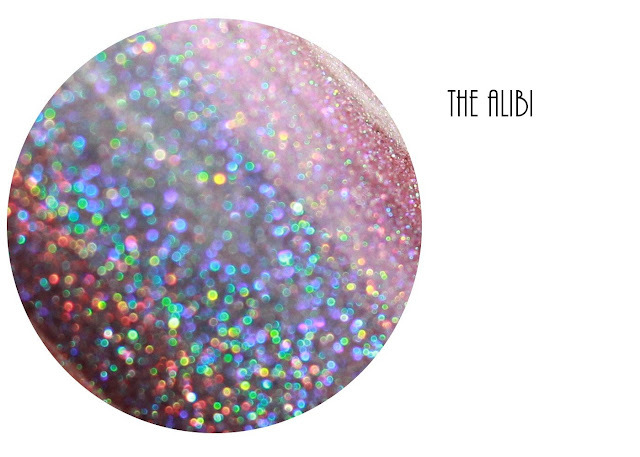 The Alibi is a teal to puruple holo duochrome. It's sheer. That's the only thing I wrote in my swatch notebook for it XD I guess I used 3 coats. 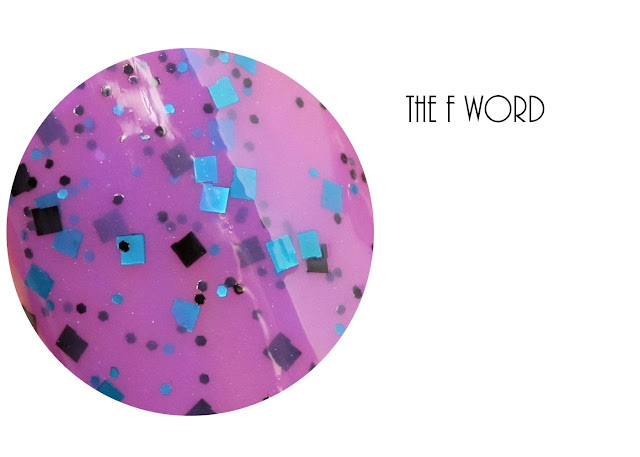 The F Word is a purple jelly-cream hybrid with bright blue and black hex and square glitters. 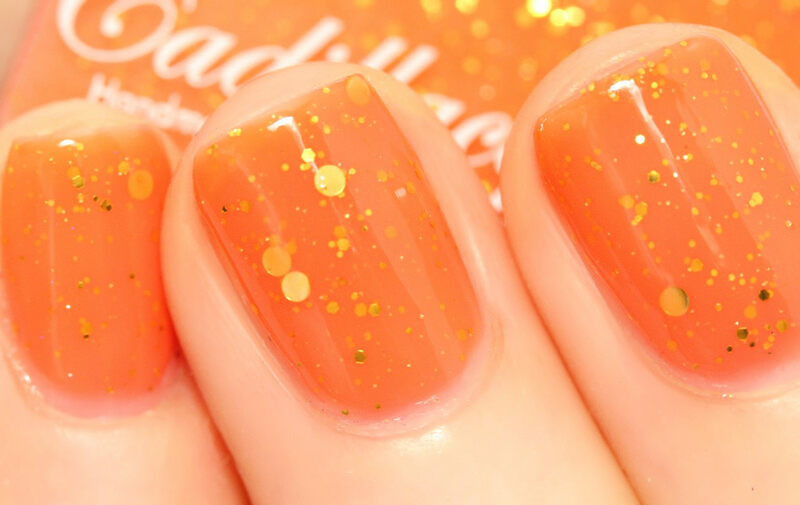 This polish! OMG, I cannot express how much I love it. 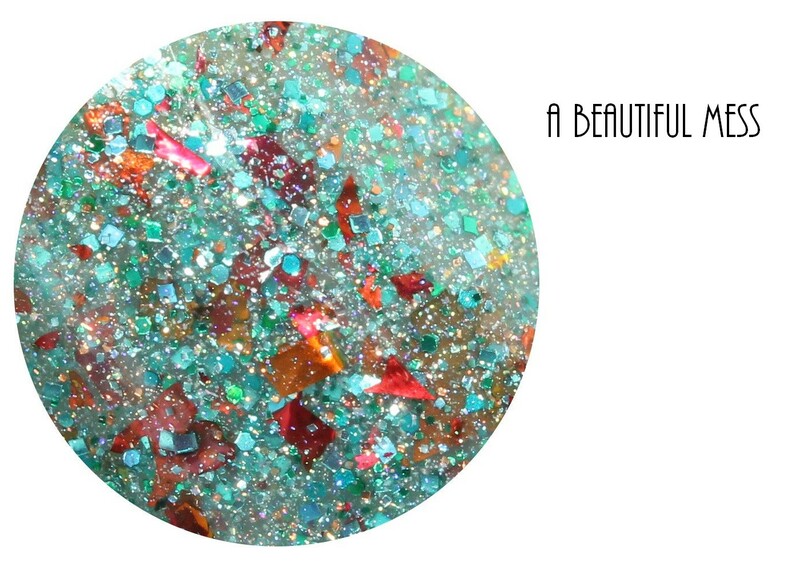 It's so unique and the color combination works so well and I absolutely love the square glitters in it! 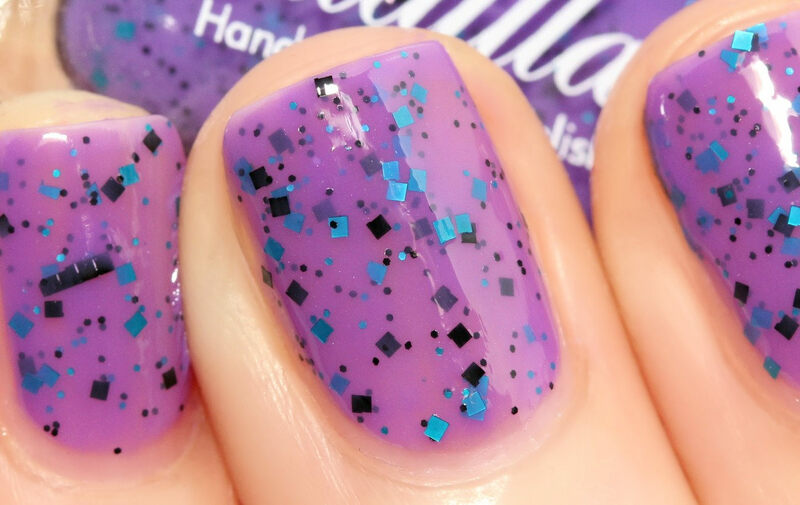 This is one of my favorite polishes from this collection! I also just wanted to mention that some of the polishes were a bit on the sheer-side, such as the "jewels" shades (I am A Storm, A Beautiful Mess and I Only Miss Her When I'm Breathing) and The Alibi, but each polish is so unique that I think the'y re worth it! It's a bit difficult to pick a favorite because I love them all but if I had to make a choice, I woud go for: The F World (a must-have in my opinion! 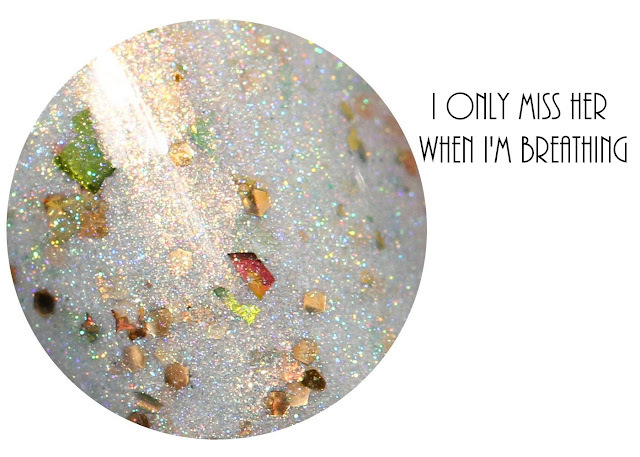 ), A Beautiful Mess, and I Only Miss Her When I'm Breathing, and Strangers on A Train. 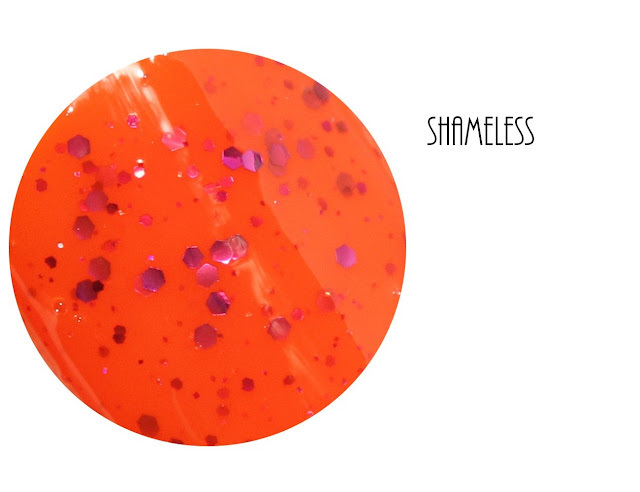 The Shameless collection will be available on May 20th, 10am CET at Hypnotic Polish . It will be available at Color4Nails later. 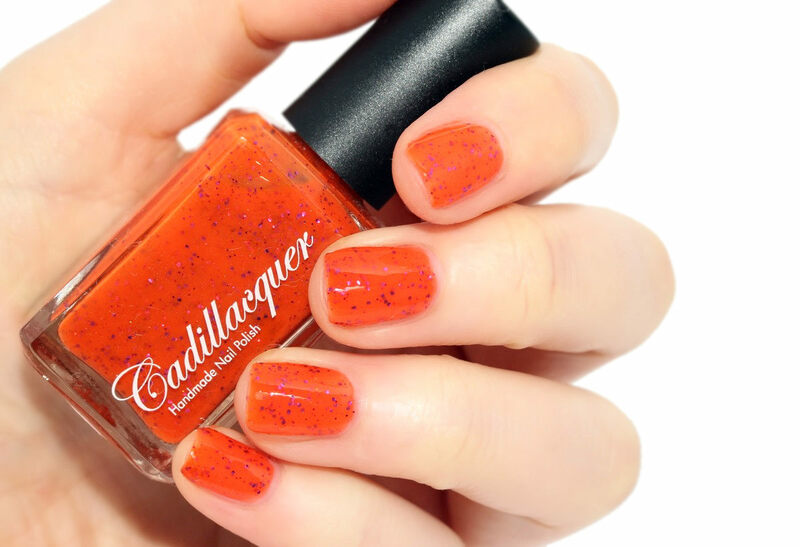 For Swiss residents, you can write to info@cadillacquer.com to order directly from them. Yay! happy to hear your got your order! I totally agree with you, when I first saw I got so excited. There are some gems! :D I'm looking forward to seeing them on you! I'm always impressed with Cadillacquer collections! They're each time super unique! :D thank you, Natalie! 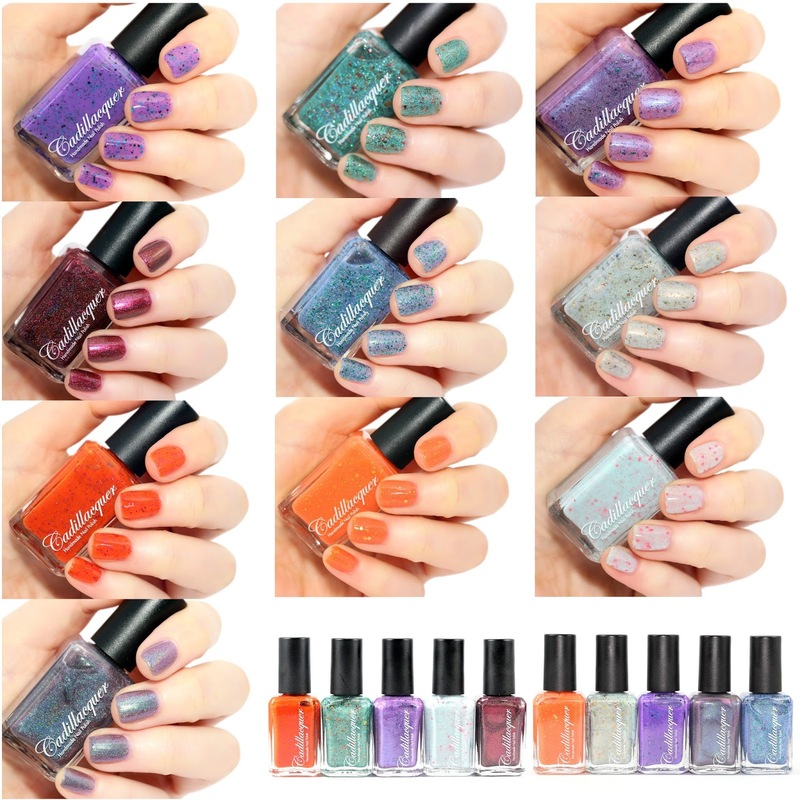 I haven't bought nail polish in years as I tend to have gel done but this collection may change my mind. I don't think I can decide on a favourite! 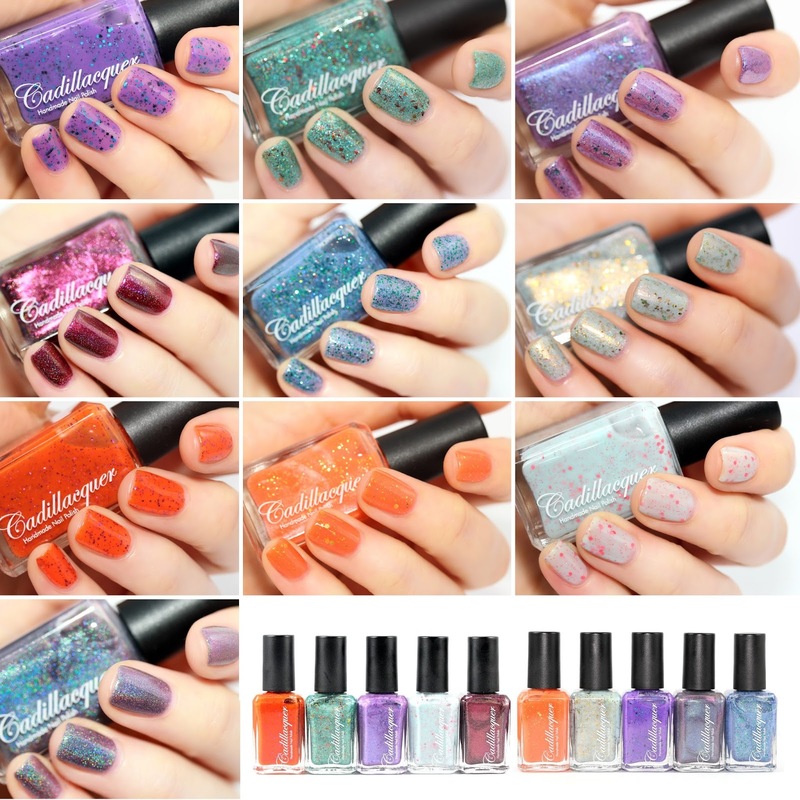 haha I love changing my nail polishes often so I couldn't go for gel polishes but I have to agree that it could be convenient sometimes!! Gostei do vinho e do verde.